The "Star Trek" universe spans multiple movie franchises. 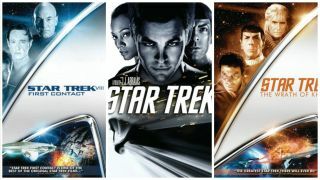 The "Star Trek" franchise was born on television, but its big-screen incarnations have become a central part of the "Trek" canon. Here's a quick index of all live action "Star Trek" movies. The television show now known as "Star Trek: The Original Series" aired from 1966 to 1969. It spawned one of the most beloved, long-lasting and far-reaching fictional worlds ever created. Nearly 50 years after its debut, the "Star Trek" universe includes six television shows (with another one in the works), 12 Hollywood films (with the newest installment debuting in the summer of 2016), and a slew of comic books and novels. A still publicity image shows an ominous crash in the film “Star Trek: Into Darkness." We've divided these films up into three categories: the movies following characters from "The Original Series," and starring the same cast from the TV show; the movies following the characters from "Star Trek: The Next Generation," (one of the subsequent "Trek" TV shows that aired from 1987 to 1994); and the movies featuring a new cast of actors portraying characters from "The Original Series." The "Star Trek" movies all follow members of an elite organization called "Starfleet," which serves as an exploratory and peacekeeping service for an interstellar republic of various sovereign planets, called the United Federation of Planets, or "the Federation." In the movies, the crewmembers typically operate some version of a Federation starship called the USS Enterprise. Movies featuring the characters and original cast members of "Star Trek: The Original Series"
The poster for "Star Trek: The Motion Picture," (1979). When a strange, threatening cloud of energy is spotted heading toward Earth, the crew of the USS Enterprise is asked to investigate. Captain James T. Kirk (William Shatner) takes command, but as Kirk and his crew explore the anomaly, they discover that their adversary, called V'Ger, is a being of immense intelligence with an ancestral tie to Earth. While "The Motion Picture" is more cerebral than action-packed, it raises questions about the long-term consequences of space travel, and the tools that modern-day humans use for that purpose. The second "Star Trek" movie involves a battle over the Genesis Device, which is used to make uninhabitable worlds habitable for new colonies. As a result of one such colonial campaign, Kirk comes into contact with Khan Noonien Singh (Ricardo Montalban), a 20th-century warlord and genetically engineered "superman," whose strength, intellect and brutality almost allowed him to commandeer the Enterprise once before. In confronting Khan, Kirk comes face-to-face with his own past — and, for the first time, his own mortality. Considered by many to be the strongest film of the entire "Star Trek" franchise, at its core, this movie is about the loyalty of family. The poster for the movie "Star Trek III: The Search for Spock." After the events of "Wrath of Khan," Kirk and his crew decide to mount a seemingly impossible mission to search for their friend and crewmate Spock, who has died, but may not be fully gone. To do so, the crew must go against Starfleet orders. Meanwhile, the Klingon Empire has its eye on the Genesis Planet, and sends Commander Kruge (Christopher Lloyd) to investigate. Kruge, a capable commander who prioritizes duty over personal attachment, forces Kirk to make an impossible decision: Will he sacrifice his family in order to save his dearest friend? In the year 2286, an alien probe appears in orbit around Earth and begins wreaking havoc on the planet. Efforts to communicate with and disarm the probe reveal that it speaks the language of long-extinct humpback whales. The crew of the Enterprise decide to travel back in time to the 20th century to study whale songs. Kirk and his crew are forced to learn about 20th century culture while trying to persuade the caretaker of two humpbacks to help them. The fate of the world is at stake in this time-traveling adventure, but it's also a way for the Enterprise crew to rebuild old friendships after the harrowing events of the last two films. Spock's half-brother, Sybok (Laurence Luckinbill), is on a quest to find a powerful deity at the center of the galaxy. In order to get there, he hijacks the Enterprise crew by freeing them of their accrued psychological pain. As they near their destination, Kirk and the crew discover how their failures have shaped them at least as much as their successes, and that a true spiritual journey happens within oneself. This movie has a confusing plot and takes the cast's personalities in unexpected directions. Movie poster from "Star Trek: The Undiscovered Country." Movies featuring original cast members of "Star Trek: The Next Generation"
An energy ribbon called the Nexus twice threatens to rip apart the Enterprise. Tolian Soran (Malcolm McDowell) has become obsessed with returning to the Nexus and living forever within it, no matter how many innocents have to die along the way. Picard, having recently faced a death in his own family, must confront both Soran and his own disappearing legacy. The movie is moving and beautifully shot, but its saccharine tone and emphasis on transition from "The Original Series" to "The Next Generation" make it less of a traditional "Trek" film than others. Movie poster art from "Star Trek: First Contact." Picard and his crew must travel back in time to prevent the Borg — a vicious species that assimilates every civilization it conquers — from making "first contact" with the Earth and assimilating the entire population. The Borg Queen (Alice Krige) does not simply want to conquer Earth; she wants to twist Picard and Data into becoming Borg, of their own free will. Though the Borg Queen pretends to offer them exactly what they want, the cost would be their own humanity. The movie has a confusing plot that falls outside of "The Next Generation" crew's previous encounters with the Borg, but the cast shines with good humor and emotional performances. Picard and his crew encounter the Ba'ku people, who are effectively immortal, gaining their eternal youth from particles radiated by their planet's ring system. Ahdar Ru'afo (F. Murry Abraham) pretends to act in the interests of the Federation, but his motivation is much more prosaic: get revenge against the Ba'ku people who exiled him for his violent tendencies, and steal the healing power of the planet, simultaneously poisoning it. But deciding how to proceed presents a moral dilemma for Picard and the crew. Considered one of the weakest of the franchise, the movie is punctuated by a singalong and a useless love story. Captain Picard is one of the most morally upright officers in the Federation, but Shinzon (Tom Hardy) shakes Picard's convictions to their core. Shinzon, a discarded clone of Picard, grew up in a cruel labor camp, and rose to power as a Romulan warlord rather than a Federation diplomat. The gentle Picard must face the fact that, under different circumstances, he could have become just as cold, ruthless and bloodthirsty as his adversary. Poster from the 2009 movie "Star Trek." The first entry into the reboot of "Star Trek: The Original Series," this film uses characters and some plot lines from the original movies and TV show. The movie follows the young crewmembers of the U.S.S. Enterprise just as they are entering Starfleet Academy. Instead of a gentle training exercise, the crew's first mission suddenly becomes a real-life rescue situation, when a Romulan ship launches a surprise attack on Starfleet. Leading the attack is Nero (Eric Bana), a Romulan seeking revenge on a member of the Enterprise crew. Tension builds between Kirk and Spock as they try to understand Nero's motivations. The pair find a way to collaborate, and finally realize that they must each forge their own paths through life, and shed the expectations set for them by other people. This movie is flashier and faster-paced than traditional "Star Trek" films, and the new cast's comfortable handling of their roles makes this a fun watch. A terrorist attack on Starfleet prompts Kirk and his crew to go in search of the renegade Starfleet operative charged with the attacks. Kirk and his crew find and imprison the man in question: John Harrison (Benedict Cumberbatch), now operating as a political terrorist. But Harrison has with a much more complicated past than he lets on. The movie borrows heavily from previous "Star Trek" films. Due out on July 22, 2016 and featuring the same cast as the "Star Trek" films of 2011 and 2013, the franchise will likely get a jolt of adrenaline from director Justin Lin (best known for working on several movies in "The Fast and the Furious" franchise). Elizabeth Howell and Marshall Honorof contributed their extensive Trek knowledge to this article.